Abstract: The Asus extreme N6600TOP/TD/128M/A PCI Express x16 videocard uses a vanilla GeForce 6600 GPU, but backs it up with Samsung GDDR3 memory (128MB, 2.0ns DRAM). When one looks around at the different sectors of the videocard market - low end, mainstream, high end - all indicators are that nVIDIA has got the mainstream product down pat. The PCI Express GeForce 6600-class videocards are better than ATi's Radeon X700 Pro, largely due to SLI, and when we look back to AGP solutions the situation is even brighter. There is quite a price & performance gap between nVIDIA's GeForce 6600 and 6600GT class videocards, even though the names are very similar. Crafty manufacturers are trying to capitalize on this, and Asus is the latest to try its luck. 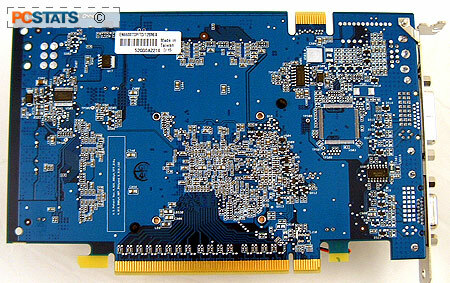 The Asus Extreme N6600TOP/TD/128M/A PCI Express x16 videocard uses a vanilla GeForce 6600 GPU, but backs it up with Samsung GDDR3 memory (128MB, 2.0ns DRAM). ASUS has also set the GPU and memory clock speeds of this card considerably higher than that of a stock GeForce 6600, accordingly the speeds are 400Mhz core and 900MHz memory. The Asus Extreme N6600Top videocard natively supports TV-Output as well as dual analog monitors (care of the included DVI-analog converter). The software bundle is a bit on the thin side with just the game Joint Operations: Typhoon Rising, AsusDVD, PowerDirector 3DE and Medi@ Show SE 2.0 included. The N6600TOP installs into a PCI Express x16 slot, and is SLI compatible too. 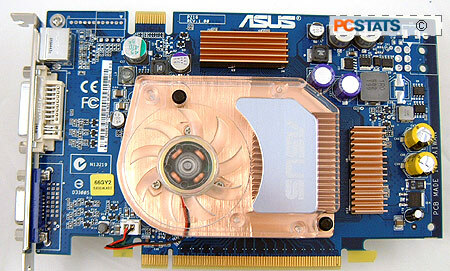 The Asus Extreme N6600TOP/TD/128M/A uses the same PCB layout that higher end GeForce 6600GT videocards employ. Asus is not the only one who uses a blue PCB and we noticed that the card looks virtually identical to Gigabyte's GV-NX66T128D videocard, aside from a different cooling system. The Asus Extreme N6600TOP/TD/128M/A appears to have been built with overclockers in mind as it is equiped with a pretty hefty aluminum GPU cooler. During testing we could barely hear the fan even though it our test system was not enclosed inside a case. The memory is cooled with some small heatsinks which work quite nicely. The heatsinks are attached to the memory via double sided tape, those of you who are adventurous might want to remove that and replace it with thermal epoxy. Officially speaking, only GeForce 6600GT class videocards and up are supposed to support SLI mode. But it should be possible to make two Asus Extreme N6600TOP/TD/128M/A GeForce 6600 cards run together, since the PCB includes the SLI connector. We were unable to test this feature, as the manufacturer only supplied one card for evaluation. About the only thing I have to complain about is that Asus does not include a printed user manual. Having one on CD is fine, but it doesn't help much if someone is having problems installing their videocard. Especially as the quick installation guide is also a bit thin on information. Pg 2. Built for overclocking, so how does it do?